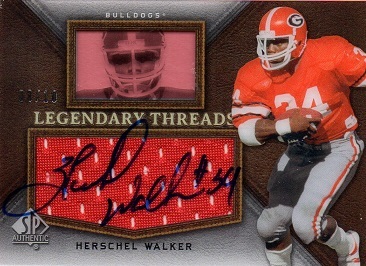 The latest autographed Herschel Walker card to join the Hoard is a 2012 SP Authentic Legendary Threads card. 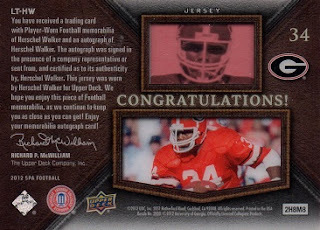 Herschel has signed his name directly on a swatch of material from a jersey. This card is serial numbered to 10, with this being #8. The serial number is just above the LE in Legendary on the card front. There is also a Legendary Threads Patch card in this series, which is serial numbered to just two.